We are a father and son team and we run classes in the Warrington area. Thank you for visiting our website, committed to providing martial arts excellence. Our aim is to offer a safe training experience and family friendly martial arts tuition, open to all capabilities and ages from 4 years upwards. 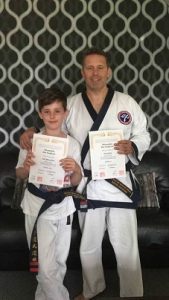 As qualified instructors, we strive to offer 100% support to each of our valued students when we join you on your journey from white belt to black belt. Martial arts will not only teach you invaluable self-defence techniques, but other benefits include. * Improved fitness and subtlety. *Higher energy levels. *Increased confidence, self-belief, and courage. *Relieves stress and improve mental wellbeing. *Helps children to develop discipline, respect and encourages higher moral standards. *Excellent opportunities for your family to engage in a fun activity, that can only strengthen the family bond. We will be there to encourage, guide and motivate you, whilst you learn at your own pace. If you think you might like to try something new, meet new people and make new friends, then why not come along and try your first class for FREE. Call 07904 114483 today and take that 1st step on your exciting journey.